Only in Napa Valley will you be crossing the street after lunch and the car honking at you is your wine buddy Stéphane Vivier, winemaker of HdV and his own wine Vivier. And in the car co-piloting is none other than Aubert de Villaine, co-owner of Domaine de la Romanée-Conti (DRC) and HdV. Excited to talk with Aubert, it was also a good reminder of how much I like Stéphane's winemaking efforts at both HdV and Vivier. 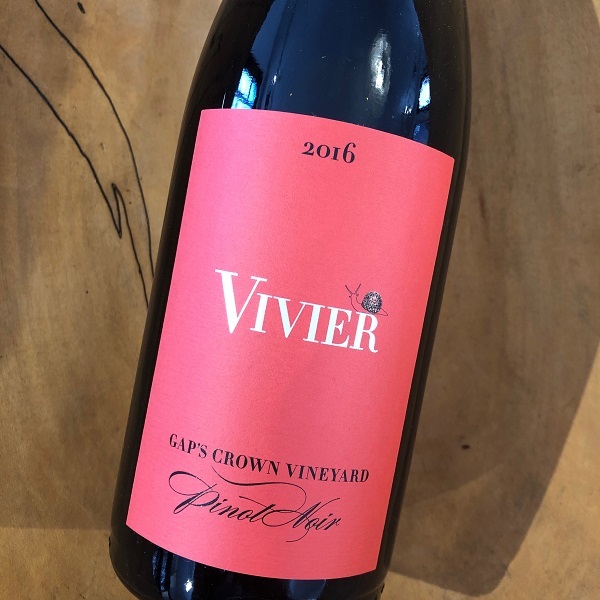 So now we are getting to offer the 2016 of Vivier Gap's Crown Pinot Noir. Gap's Crown, tucked on the western hillside of Sonoma Mountain, is fanned by the cool ocean breezes that push through the Petaluma Gap. Their block is between 980-1180 feet above sea level. This is a favorite of Stéphane because of the long growing season, rocky soil and inhospitable weather. This wine is a must-try Sonoma Coast Pinot Noir if you missed our offering last year for the 2015. 100 cases were produced.